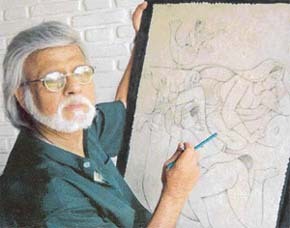 SATISH Gujral is now like a person who is born anew every December 25. But unlike Christ, he carries no mission except to find himself. He has translated the world of silence into terms that has made the observer a convert to his visual imagery. He has carried his spectator along with him in fierce renewals of creativity every now and then, with each new exhibition. "There’s more motion in my works now"
NADIA Rizvi is barely five years’ old and attends kindergarten school. But she does not play with dolls, crayons and plastacene. She does not like toffees and chocolates because they are "gooey". She hates milk because it makes her more "tubby". She hates frocks because they make her look "silly". THE September of 1979 seems a century ago. My wife and I had ventured on a six-week-long grand trek of Ladakh which today would pass for a fable. For company we had four baggage ponies, their owner and one guide from the Ladakh Scouts. THE man, the machine, Dev Anand. This can be one of the most apt ways of describing the "evergreen hero", the famous epithet he is known by. Well, that’s what Dev saab, as everyone in Bollywood addresses him, is — a true evergreen hero. He has been wooing audiences since the ‘40s. Yes, he has been the heartthrob of at least three generations of star-struck female fans. Baghban brings together Amitabh Bachchan and Hema Malini once again as a pair after two decades. Ravi Chopra, director and son of B.R. Chopra, discusses his film with Vickey Lalwani. EVEN as their children struggle to carve a niche for themselves in the Hindi film industry, Amitabh and Hema Malini are making waves as they star in yet another film together after a long gap. Baghban is a family drama. And like all other B.R. Chopra films, it has a social message. TIME OFF: Vedic fantasy to come true?